With free Wi-Fi, this room includes a private bathroom and a garden view. This room cannot accommodate an extra bed. floor, Hardwood/Parquet floors, Wake-up service, Wardrobe/Closet, Garden view, Mountain view. All children are welcome.! One child under 2 years stays free of charge when using existing beds. One child under 2 years is charged EUR 3 per person per night in a child’s cot/crib. 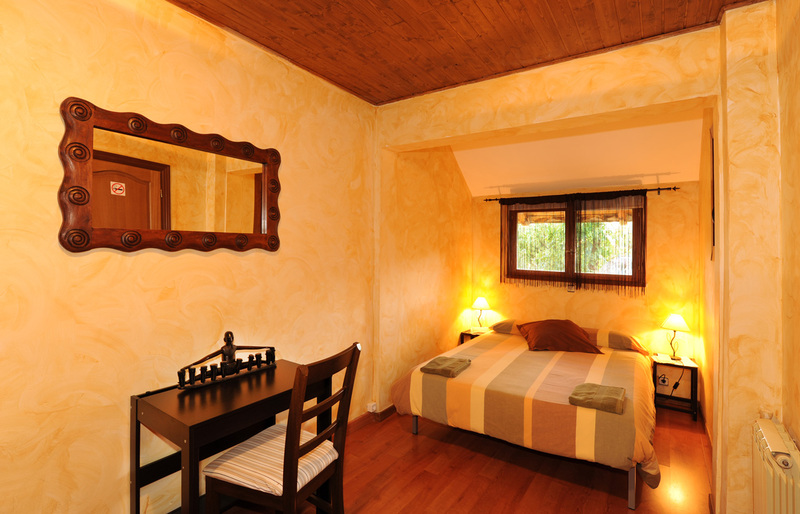 All prices include taxes, except the TAXE DE SÉJOUR of 0,33€ fee per night and person older than 18 years. *) Classic breakfast price is 6,50€ per adult and 4,90€ per child aged between 3 and 10 years old. Full breakfast price is 7,50€ and 5,50€ for children. *) Price of dinner is 16,00€ per adult and 10,00€ per child aged between 3 and 10 years old (drinks not included). *) The price of Pic-nic’s coat is 6,90€ per person. *) Price per night for children under 3 years old (cradle plus foods) will depend on each case. *) A 10% of discount will be offered for all bookings from three nights minimum and 20% from seven nights minimum. *) Rooms will be cleaned daily. Towels will be changed every 3 days ans sheets every 7 days. *) High Season (Nights): 1 to 7 January, 24 to 28 March, 13 to 16 May, 23 to 26 Juny, 15 July to 27 August, 28 to 31 October, 2 to 10 December and 25 to 30 December. Please consult us the minimum number of nights in High Season. *) Mid Season (Nights): All weekends of ski-season that are not High season, from 12th to 28th February, 21th to 24th December. In Mid season, please check the minimal number of nights. 1) To confirm bookings, El Balcó de Dorres prompts an income account (deposit) equivalent to 30% of the cost of the planned accommodation for bookings of 7 nights or more and 100% of the first night in other cases. 2) To make reservations in advance in high season or on weekend, will demand a minimum of 2 nights. 1 single night bookings will only be accepted during the 5 days before the planned date of accommodation. 3) If you book the whole House is advisable do so as soon as possible. 4) Please notify by phone in the event that you think arrive later than 9 pm o’clock (in any case, the B&B House will be closed starting from les 23,00 hours). All cancellations must be communicated by letter or by email. 1) If the cancellation occurs more than 15 days in advance, the totality of the deposit it will remain at the disposal of “El Balcó de Dorres”, whereby and depending on the damages that actually caused the cancellation, will decide if it is possible to maintain the deposit and sign for another future reserve that could arrange with the customer. 2) If the cancellation is notified in advance less than 15 days from the start of the intended stay, the totality of the deposit will be available to “El Balcó de Dorres”. 3) If customer is not manifested before 19 pm the day scheduled for the start of the stay (No show), “El Balcó de Dorres” are available for rooms reserved on your behalf. In case of no-show, deposit will be entirely at the disposal of “El Balcó de Dorres”, which also reserves the right to claim 100% of the price of the accommodation provided to the customer. 4) Finally in the event that for any reason, the client has to shorten the days of stay provided, “El Balco de Dorres” billed (and therefore charged) 50% of the accommodation corresponding to the days that have been cancelled, as compensation for damages incurred. Additional benefits paid and not consumed will be reimbursed to the customer.